« “Forgotten Hollywood”- Star-Filled Panel in El Segundo! NEVADA SMITH – Like Bite the Bullet, this is a forgotten classic Western. The motion picture was a prequel to The Carpetbaggers; Alan Ladd played an older version of the character. The story was based on the Harold Robbins’ 1961 novel. The plot-line of the movie was drawn from an actual 1960 comic book series, The Rawhide Kid, inked by Jack Kirby (known for his creation of Marvel Comics Captain America). Respected director Henry Hathaway had a long career in the Silent Era and during Hollywood’s Golden Age. He discovered Randolph Scott, and he worked with John Wayne, Marlene Dietrich, Gary Cooper, and Marilyn Monroe. Hathaway received his only Oscar nomination in 1935 for The Lives of a Bengal Lancer. Other films in his career include The Dark Corner, North to Alaska, The Sons of Katie Elder, True Grit, and Airport. 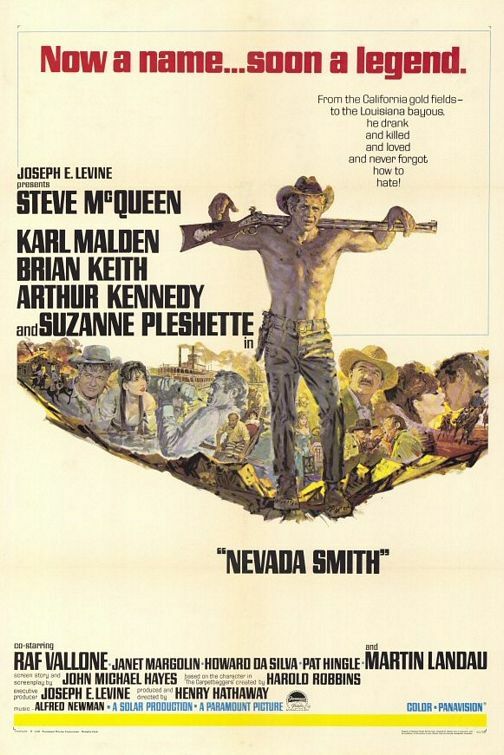 Nevada Smith featured a remarkable cast: Steve McQueen, Karl Malden, Arthur Kennedy, Suzanne Pleshette, Brian Keith, Martin Landau, Howard Da Silva, Pat Hingle, and Raf Vallone. Paramount Pictures brought in Alfred Newman to write the fabulous score. On heels of The Great Escape, Love with a Proper Stranger, and The Cincinnati Kid, Nevada Smith was released around the same time as The Sand Pebbles. 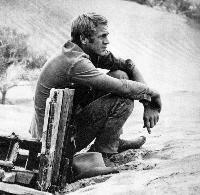 When voted by film fans, Steve McQueen emerged as the most popular actor at the end of 1966. Nevada Smith was presented in an episodic format. McQueen’s character, Max Sand, sought revenge for the murder of his folks. The most compelling was the chain gang-segment, and it featured really strong performances from Kennedy, Pleshette, Da Silva, and Hingle. The evolution of Max Sand from a vengeful son to a responsible adult at piece with his life was crafted quite well in the screenplay. More time could have been spent in the development of characters played by Landau, Keith, and Malden, since they were such respected actors. Due to the length of the film, this was just not possible. I assume great performances were left on the cutting-room floor. 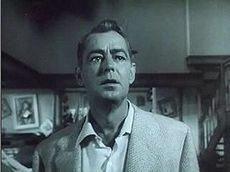 Nevada Smith was made under a cloud of Alan Ladd’s apparent suicide in 1964. The coroner ruled his death was an accident, because of alcohol and drugs, though he had previously tried a number of times to kill himself. Alan Ladd-> had played an older Nevada Smith (Max Sand) in The Carpetbaggers, but died prior to its release. If you want the complete story about Arthur Kennedy, check out Forgotten Hollywood Forgotten History, which has an entire chapter devoted to this fine rugged actor. Instead, let me chat about Howard Da Silva, who began his stellar career on Broadway. He often returned to the stage, with success in the original Oklahoma, The Cradle Will Rock, Fiorello, and notably, as Ben Franklin in 1776. <—Da Silva was a natural character actor in cinema. He co-starred in over sixty movies, and was great in Abe Lincoln in Illinois, The Sea Wolf, Blues in the Night, Keeper of the Flame, Sergeant York, The Lost Weekend, The Blue Dahlia, and Unconquered. After spending a decade blacklisted as an alleged Communist, Howard Da Silva was cast on television in the 1960’s. My personal favorite performance: Soviet Premier Nikita Khrushchev in – The Missiles of October. He also appeared in Ben Casey, The Outer Limits, The Man from U.N.C.L.E., The Fugitive, Gentle Ben, Mannix, Love American Style, and Archie Bunker’s Place. His name is almost forgotten, but, Howard Da Silva was a gifted addition to Hollywood productions. Harold Robbins is the most successful author of all time. He wrote over 25 amazing novels, selling over 750 million copies in 32 languages. In 1966, Henry Hathaway was at the Autumn of his career. He’s remembered for steady work for almost half a century. On the other hand, Iron Eyes Cody, Strother Martin, and a young Loni Anderson have cameo parts in this film. They didn’t receive screen credit. Steve McQueen became the highest paid actor when cast in The Towering Inferno, and he remains a popular star. His estate limits licensing his image to avoid commercial saturation experienced by other deceased celebrities. Consequently, Nevada Smith is an appropriate contribution to modern American Westerns, thanks to the collaborative efforts of Robbins, Hathaway, and McQueen. This entry was posted on Monday, April 30th, 2012 at 12:00 am	and is filed under Blog by Manny Pacheco. You can follow any comments to this post through the RSS 2.0 feed. Responses are currently closed, but you can trackback from your own site.